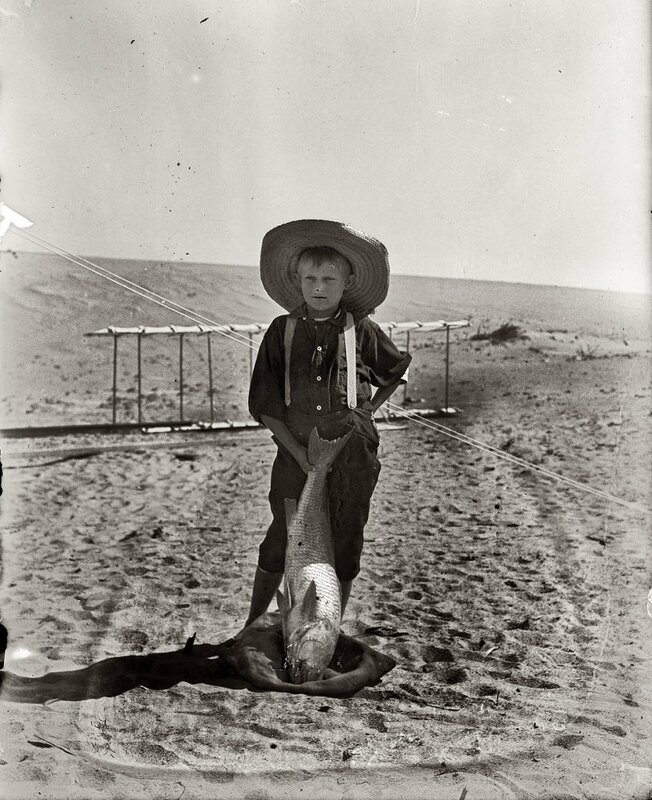 Tom Tate, the son of Captain Tate's half-brother Daniel Tate, poses with a drum fish in front of a 1900 Wright glider. Photograph by either Orville or Wilbur Wright, 1900. View full size. Submitted by Anonymous Tipster on Mon, 11/19/2007 - 11:56pm. I'd have to agree with Treefrog, i come here all the time checking out the cool pics of yesteryear, but this one sure is a piece of history, even if its contents are of a boy and his fish. Submitted by Treefrog on Mon, 11/19/2007 - 9:33pm. I try to check in here everyday because I always see something I've never seen before and more often than not I end up learning something. So today I see this picture from Kitty Hawk that's over 100 years old. And then there's this kid with a big hat holding a really big fish. Nothing too special there. And there's something I can't identify behind him that looks like it might be part of a fence line. Oh well, every day can't be 4x5 Kodachomes, I guess. Then I get around to reading the caption and that thing in the background turns out to be a Wright glider! BAM! Suddenly things are getting interesting. That would be enough of a payoff right there but then it turns out the photo was taken by Orville or Wilbur Wright! I can only imagine how you must feel when you see these pictures for the first time and unravel some of their secrets. I hope you've got a trunkload of these pictures, for your sake as well as mine.